The Rahway Arts + Business Partnership has launched an important marketing campaign to showcase Rahway, as ‘Home to Creativity and Innovation,’ building on the success stories of local residents and the city’s significant investment in the arts, innovation, and education. 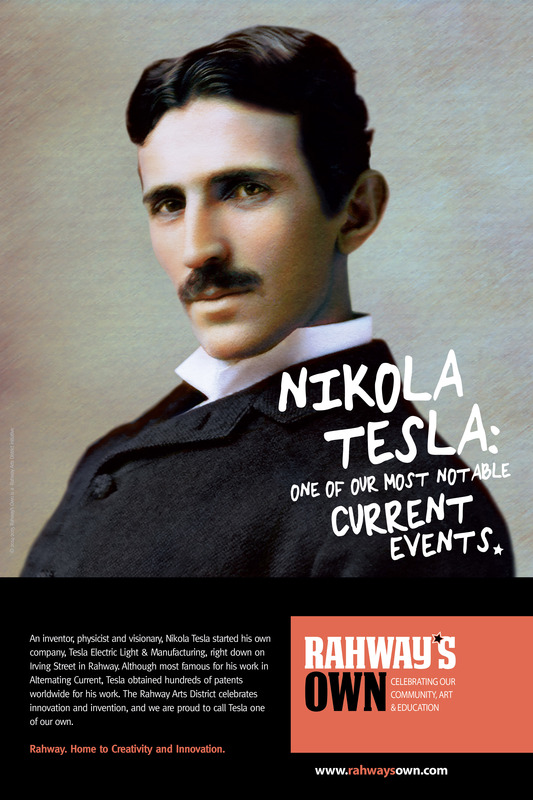 The campaign, themed “Rahway’s Own,” launched Sept. 1. It covers a range of print and digital media. The marketing initiative features a series of large-scale posters and video interviews highlighting the achievements of Rahway residents, both historical and current, from astrophysicist Carl Sagan to former San Diego Chargers defensive lineman Antonio Garay. Daphne Lee – A former dancer with Ailey II American Dance Theater in New York City, Daphne now dances with Lustig Dance Theatre in New Brunwick. Nikola Tesla – The visionary, inventor, and physicist started his company Tesla Electric Light & Manufacturing on Irving Street in Rahway. Ike Igbinosun – Known for his outstanding leadership skills and athleticism, Ike took his training from the Rahway football field to the NCAA, then on to the NFL. He currently plays for the Buffalo Bills. Carl Sagan – The well-known astrophysicist, astronomer, author, and cosmologist is also a Rahway High School graduate. Antonio Garay – Former NFL defensive lineman Antonio Garay is known for his strong tackles, colorful hair designs, and love of his hometown. Artist J.D. McGuire talks about the importance of public art within a community. He is currently working with the Rahway Teen Mural Lab to design and paint a large-scale public artwork for downtown Rahway. Rahway Mayor Samson Steinman talks about public investment in the arts and public places, and the relationship between the arts and economic vibrancy. Antonio Garay shares the stories behind the Hello Kitty smart car, his colorful hairstyles, and how growing up in Rahway helped shape his career. Amy Garcia Phillips of Contento Dance gives Rahway’s Own hosts a quick salsa dance lesson. Local shop owner and creative recycling artist Angela Pryor discusses why she has made Rahway her home and place of business. Professional dancer Daphne Lee talks about performing overseas, a typical day in the dance studio, and what is ahead of her in her career. Aussie rocker Brien McVernon explains why he’s traveled half way across the world to make Rahway, his new home. The leading artistic figures behind Ballets with a Twist, a contemporary dance company, discuss the behind-the-scenes collaboration that goes into the company’s signature program, Cocktail Hour. The “Rahway’s Own” campaign is the first comprehensive marketing campaign launched by Rahway Arts District Inc, aiming to deliver more than 16,500,000 impressions before the end of 2014. Rahway Arts District Inc is dedicated to raising awareness throughout the region about Rahway’s vibrant community and growing central business district. Rahway has been recognized for its efforts to establish a thriving local economy based on arts, innovation, and sustainability by the National Endowment on the Arts, Geraldine R. Dodge Foundation, and Sustainable Jersey.